Who would have thought locals would revolt? Overrun by 30,000 wind turbines, rural Germans are on the brink of revolt, with over 1,000 groups determined to win back their heartland. Dwarfed by 200m, 300 tonne behemoths, driven mad by practically incessant low-frequency noise and infrasound, or driven from their homes, tens of thousands of Germans have had enough. One of the largest and best organised of Germany’s community defenders is Vernunftkraft, a group headed up by ecologists, engineers and economists, many of whom are professors tenured at Germany’s universities. These people are organised; these people are angry. Here’s No Tricks Zone reporting on Germany’s brewing anti-wind industry backlash. 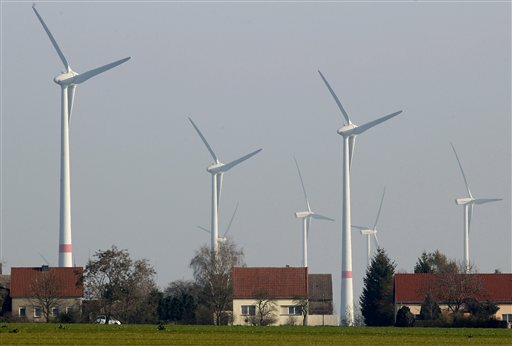 Although resistance to littering the landscape with industrial wind turbines continues to grow strongly and the power grid is becoming ever more unstable, the German government refuses to back off its expansion of wind and solar energy. Jonas Herrmann of the Swiss NZZ here comments on how Germany “is struggling with its wind turbines”. It started 28 years ago, when the German government enacted a law that forced power companies to buy up any green power produced, pay exorbitant prices for it and feed it into the power grid whether it was needed or not. Over time the installation of solar panels and wind turbines exploded and today many parts of the countryside have become littered with unsightly wind parks. Yet, Germany today remains far away from supplying its energy needs through “green” sources. Moreover, every community has been impacted, Nikolai Ziegler, says the chairman of resistance group Vernunftkraft, which is the major umbrella association of wind power opponents. According to Ziegler: “In Germany there are more than 1000 citizens’ initiatives that are mobilizing against wind energy” and that these groups are getting involved in politics. Not only are wind turbines ruining Germany’s idyllic landscape, but the NZZ writes that much of the resistance is also based on wind energy’s technical unreliability as a power supply. The Herrmann at NZZ cites engineering expert Dr. Detlef Ahlborn, who says wind energy is too erratic and thus unreliable. With the umbrella organization Vernunftkraft, everyone is convinced that wind and solar energy will never be able to ensure a secure power supply. This is a claim that the German government and green energy proponents refuse to acknowledge. Proponents in Germany believe that the problems with green energies will somehow go away and the supply will miraculously somehow smooth out if more and more volatile wind and sun capacity gets installed. Critics like Nikolai Ziegler also criticize that there really hasn’t even been any real Energiewende (transition the green energies) so far because electricity is only one fifth of Germany’s total energy demand. Green energies provide only one third of that one measly fifth, and so “it’s relatively meaningless”. The NZZ notes that “most of the leaders of the protest group Vernunftkraft are “male in the second half of their lives” who “are united by their anger at wind energy”, but adds most have a background in natural science almost half of them are professors. However, a political majority is not in sight. Although the AfD and parts of the FDP [parties] believe the Energiewende is a mistake, the German government can hardly prevent further expansion of renewable energies. Germany is thus still on the path to the unknown with the Energiewende. My gut instinct tells me we’ve been bamboozled by Big Pharma’s big sister – Big Wind. The ideologues have bought into the Turbine theory hook, line and sinker. I don’t really blame them and I do believe in climate change. After all, who can watch time-lapsed video of rapidly melting icebergs and still deny the planet is warming? That said, I think sometime within the next ten years facts and figures will speak for themselves. Turbines will either need to be reconfigured or tossed in a junk pile. But unscrupulous wind developers won’t really care because they’ll already have earned their billions from an overly eager but very gullible Public. A million industrial wind turbines won’t give us what we need and currently are nothing more than a distraction from more complicated but necessary actions which ALL citizens must contribute to. Only nuclear power can supply what will be needed as wind and solar fail industrial and domestic requirements for 24/7 365 power reliability. Using taxpayer money to subsidize unreliable energy production is against a nation’s competitive position. The whole thing has been a misconceived mess. The UN needs to take stock of the damage being done for no gain. For them to have forced countries to sign an agreement to cut energy emissions without even considering how this could be achieved and consequences of the favoured way (wind turbines) is nothing more than a complete lack of insight and intelligent thought. That countries signed it is even more perplexing, to think our so called intelligent Politicians could have fallen for such a nonsensical program is beyond a joke. They have led their nations down the path of self destruction without the consent of their people. They have been led by ideologies that cannot see beyond making money and/or fairyland dreaming. How they could even think it was possible to build and install massive structures that create thousands on tonnes of emissions in their construction, transport and installation is beyond me. More damage is being done by the construction, transport and installation of Turbines and now battery’s than is saved by their operation. Not forgetting the health and environmental damage being caused at every turn of a blade. Its time these Leaders, leading their nations to doom stopped and withdrew from this nonsensical agreement, allowing their people to move towards prosperity and health once again. Yes the world could be warming but then it has for thousands of years, and yes some small island nations may have to consider they will need to move off their lands – but then that’s been the way of the world since time began. Wasn’t the world populated by the movement of people across lands as climate’s changed. The first step to restoring sanity is to disband the useless globalization organization aka the UN. Ontario Society of Professional Engineers (OSPE) have written about the difficulty incorporating intermittent wind and solar energy into the electrical grid. Our government failed to listen. Please read the both the report and the comments following. The main puzzle is the politicians’ adherence to suport of the scams based on claimed manmade climate change in particular regards the folly of decarbonisation and the renewables scams, a success only for their troughers in the money, coming from us taxpayers.